(We) are Behavioral Health Specialists in the US Army. 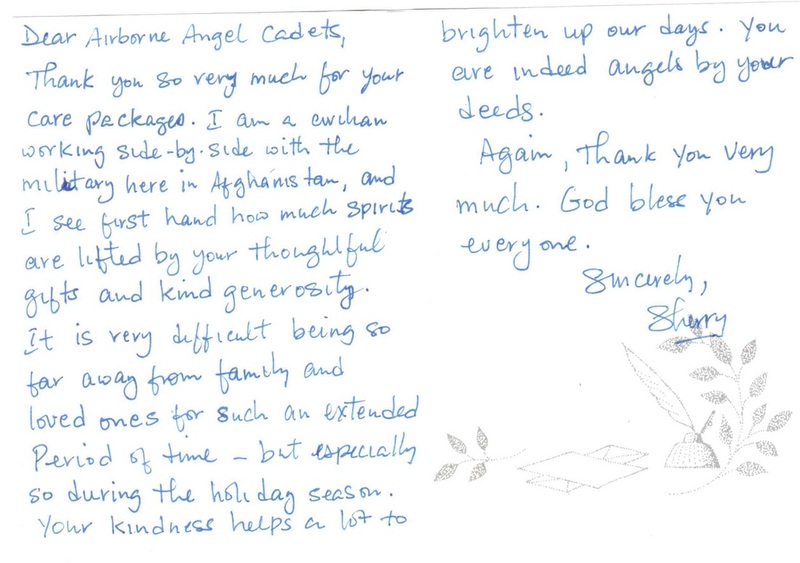 I would like to share with you (Airborne Angel Cadets of Texas) our excitement to continue this outstanding care package mission. As we hand out the goods that you send to us daily, I would like to stress how happy you are making the Soldiers here. I am sure you are aware of the area we are in and the lack of food and other essentials that are here, and it is helping Soldiers more than words could explain. Everything from getting the essential hygiene products they need to the nostalgic piece of candy that helps brings smiles to help keep us all grounded. We are currently in the process of shutting the current FOB down and moving over to another less developed FOB. The goods we receive have been the primary source of goods for all the Soldiers living not just on our current FOB but of the entire Area of Operations. Thank you again for your unbelievable support, and we look forward to continuing this project. Thank you very much and please extend my gratitude to all that support. I cannot stress enough how your support helps us so very much. I will be sure to collect requests from Soldiers as we distribute the goods. This is my second deployment and I was not aware of things like this before, and to see the positive effect it has, and the influence that it carries to all is something that I am absolutely amazed with. I am thrilled to continue this mission. I just assumed that it was a norm to go through a year with everything smelling foul and eating just what is provided. I will share a story of one of your donations reaching and making a very positive impact on a Soldier. A Soldier comes in to pick up beef jerky and while grabbing it sees a particular candy and has a huge grin form across his face. He immediately tells how he buys this candy for his children and ends up eating half the entire bag before his children even get a chance to eat it. We all share a laugh and he is distracted from the current situation of war and reminded of a loving family.